Mudbound is a period-piece drama that takes place before, during, and after WWII on a cotton farm in Mississippi. It’s based on the novel written by Hillary Jordan, with themes of poverty, racism, violence, and a divided America. With stellar direction by Dee Rees, we follow six main characters as they navigate their lives under horrific circumstances in a film that looks like a beautiful piece of literature projected on the big screen. This graceful, disturbing film gives us an intimate portrait of that time. Get ready to be immersed in character, choices, and consequences. Two poor families farm the same area: one white, owners, and one black, sharecroppers. They are forced to follow Jim Crow segregation laws due to the social climate of their Deep South locale and the fear of the violent Ku Klux Klan. Both families farm the same patch of land in the hard times; the often muddy Mississippi Delta is an unsympathetic place where dreams simply die or are diluted in the mud. Jason Clarke, as landowner Henry McAllan, gives a cold, unbending performance in his outstanding portrayal of an unsympathetic character. He leaves the comforts of his Tennessee home with his new bride, the obliging, soft-spoken Laura (Carey Mulligan), to farm a plot of land with extremely harsh conditions. Ten minutes into Laura’s new circumstances, we are horrified to see her shockingly primitive living conditions. Mulligan gives an outstanding performance as well, as she transforms from her initially docile persona by blossoming into a fighter and a strategic problem solver, all while protecting herself and her children. And what a difficult situation to contend with. Not only is the dreary mud-soaked farm a challenge, Laura’s father-in-law, Pappy (Jonathan Banks, from Breaking Bad and Better Call Saul), is a mean-spirited bully and an angry racist who also lives with the family. Henry’s younger brother, Jamie (Garrett Hedlund), stars as a handsome, outgoing WWII overseas fighter pilot who suffers from post-traumatic stress disorder (PTSD) due to his service in the war. Their neighbors, Hap Johnson (Rob Morgan) and Florence Jackson (Mary J. Blige), whose families have worked the same land for generations, as their descendants were enslaved laborers, dream of owning a small patch of their own someday despite their daily struggles. The performances in this finely tuned script are all excellent, although the best lines are given to Mary J. Blige, who completely transforms into Florence; she’s unrecognizable as the famous rhythm and blues singer that we all know. The Johnsons also have a son, Ronsel (Jason Mitchell), who goes off to war. We see scenes from his heroic war battles and the life he has overseas. Both families are puzzled by the friendship forged by Jamie and Ronsel when they return from the war. Their relationship is mesmerizing to watch, as each has been changed by the war and bond together in spite of the bigotry in their town. Ronsel is never supposed to ride in the front seat of a car with a white person; he and Jamie snicker to each other as they oppose the rule. The townspeople begin to talk negatively about their relationship and take matters into their own hands. All the while, the plot has been simmering to a boil, and when it does boil, it’s tough to watch, but important to know the facts about how cruel and barbaric people really were during that time period. Parents be warned—the violence is bloody, brutal, and inhumane. I don’t want to give away much more of the story as it’s better to see it unfold, but I will tell you that Ronsel finds out he has a son by a woman he was in love with during the war — and that the film does end with love. 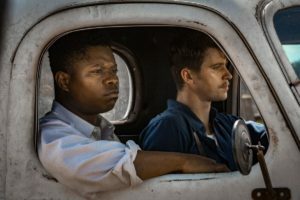 Mudbound is a film that will stay with you long after the credits roll. This is an important film, one that people need to see to understand the history of our country and the cruelties of what people had to endure and the bravery of the heroic people that stood up to racism. Hillary Jordan is currently writing a sequel to Mudbound; the working title is Fatherlands. Bottom Line: One of the best films of the year; I will watch it again several times. All areas are fantastic; directing, acting, script, and cinematography are all top-notch. We learn of the characters through their inner voices, which deepen our connection and empathy. Wow—what an excellent film. Cast: Carey Mulligan (Laura McAllan), Jason Clarke (Henry McAllan), Garrett Hedlund (Jamie McAllan), Jason Mitchell (Ronsel Jackson), Mary J. Blige (Florence Jackson), Jonathan Banks (Pappy McAllan), and Rob Morgan (Hap Jackson). Credits: Directed by Dee Rees and written by Virgil Williams and Dee Rees.